See Visitor Center page for holiday closures. The Visitor Center is closed New Year's Day, Martin Luther King Jr. Day, Easter, Memorial Day, Independence Day, Labor Day, Thanksgiving Day, Christmas Eve, Christmas Day, and New Year's Eve. 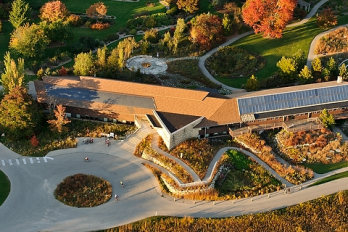 The Visitor Center (previously the McKay Natural Awareness Center) was constructed in 1977, with a 16,000-square foot addition built in 2001. State-of-the-art photovoltaic cells, added as part of the expansion, convert sunlight into electricity to help meet the building’s energy needs. Rainwater from the roof is channeled to rain gardens to prevent contributing to storm-water runoff. The Arboretum Bookstore carries a broad selection of nature, gardening, and science titles for all ages and interest levels, as well as nature-inspired gifts, Arboretum apparel, and home decor. Go to the Bookstore page for more information. celebrates Wisconsin’s natural heritage and the human connection to the land through visual arts by showcasing the creativity and talent of artists inspired by nature. Go to the Art Gallery page for information about the space and the selection process. The auditorium and classroom may be rented for university, nonprofit, and private events. Go to Facility Use for more information.